Join us for a webinar that will show you how you can perform both text analysis and data mining within an interactive, visualisation-based environment. Many corporations, government agencies and academic institutions around the world rely on IBM SPSS Modeler Premium to reveal insights hidden in their data that will help them improve outcomes and reach their goals. The intuitive graphical interface makes it easy to see every step of the data mining process as part of the “stream”. Text analytics is straightforward and efficient, with interactive graphs to help you explore and display text data and patterns for instant analysis, as well as powerful classification and categorisation techniques that transform text into an analytical asset. Who uses IBM SPSS Modeler Premium? Banking and financial services firms make their marketing campaigns more effective, evaluate credit risk more reliably and spot potentially fraudulent activities more efficiently. Insurance companies fine-tune marketing efforts and streamline claim processing while identifying fraudulent claims more reliably. Telecommunications companies develop more intimate customer relationships in order to build loyalty and reduce customer defection or "churn". Retailers improve their assortment planning and fine-tune their marketing and customer loyalty efforts. Utilities and energy suppliers offer more personalized service to customers. Analytics also plays a role in preventive maintenance, which results in greater reliability at less cost. Government agencies manage functions as diverse as tax audit selections, military force recruitment and proactive policing and public safety. Healthcare organisations use predictive intelligence to proactively manage their resources and fine-tune their practices to provide better patient care customers. Analytics also plays a role in preventive maintenance, which results in greater reliability at less cost. This webinar will focus around the What, Why and How of Sales Performance Management (SPM) and Incentive Compensation Management (ICM) automation. Learn What SPM can do for your organisation, its benefits and real life stories of other organisations and how they are thriving in a new, more automated world. Based upon research, you will also be exposed to the answers as to Why organisations embark on the journey to automation. Finally, you will be shown a demonstration as to How an automated solution can be used to enhance sales performance, reduce administrative headaches and allow your organisation to move from a day to day survival mode of calculation to using IBM’s ICM solution as a strategic advantage. OpenSymmetry is a trusted leader and global advisor that delivers Sales, HR and Finance solutions to drive accelerated business performance. With a leading success rate across more than 20 industries worldwide, you can count on OpenSymmetry to deliver the comprehensive solutions you need for a proven path to rapid results. James Mulligan - James has been working in the SPM industry for over 9 years. With experiences across numerous products and platforms, as well as multiple implementation and selling roles, James has the knowledge and experience to speak to every level of the SPM engagement. James joined Varicent (now IBM ICM) in June 2006 as an Implementation Consultant and held numerous roles at both Varicent and IBM, before moving to OpenSymmetry in 2014 to lead sales in EMEA. Jon Clark – Jon joined OpenSymmetry in 2009. He leads the Strategy Services practice for EMEA, which focuses on Smarter Sales development, incentive plan design, business case for automation and future state design. In addition, Jon has experience in wider reward and performance management design. IBM SPSS Modeler extends the value of Big Data through algorithms purpose-built for massive scale analytics, introduces geospatial analytics and continues to expand accessibility to and usability of advanced analytics. The webinar also includes a live demo of IBM SPSS Statistics version 23. - Solve complex business problems with optimization with the latest toolkit for mathematical and constraint programming. - Integrate predictive and prescriptive analytics to transform insights into targeted planning and scheduling, supply chain and asset utilization actions that generate competitive advantage. - Leverage the cloud for deployment, extensibility and scale through the latest cloud offerings and community assets. Unions and Non-profits share a common core: success is critically dependent on their ability to maintain active and involved supporters as well as continuously attracts new participation. With increased competition for support and limited resources available, organizations must be smart and efficient with their outreach efforts.. This can be made possible with predictive analytics - a tool that unlocks the hidden insights and patterns in your organizations' data and allows you to make strategic decisions that are best-fit for your organizations needs. From a marketer’s perspective, by looking at why a customer is valuable to us, we can understand the characteristics of our most valuable customers and use this to predict which new customers we should target. Join this session to understand how predictive analytics can help you to target those only most likely to respond to offers, identify which offers to send to these customers and tailor your products and offerings towards customers’ specific needs. Identifying which customers are likely to respond to specific promotional offers. Developing a marketing strategy for each customer group. Comparing the effectiveness of direct mail campaigns. Boosting profits and reducing costs by mailing only to those customers most likely to respond. Identifying by postal code the responses to your campaigns. Unlock insight from almost any type of data and find the answers you need. Organisations of all sizes rely on data mining and text analytics to reveal insights hidden in their data to help them.. Improve customer, employees, citizen, patients satisfaction. 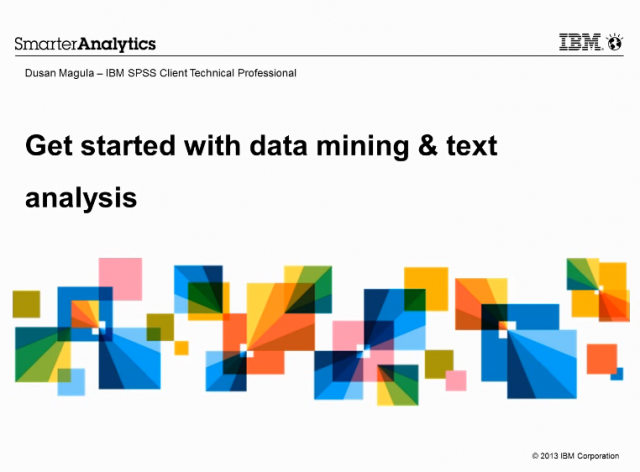 In this presentation we explain how these technologies work and show you how you can easily get started with data mining and text analytics with IBM SPSS Modeler as it requires no programming. You don't need advanced analytical skills to be able to build predictive models in the visual, interactive interface that guides you through each step and automates predictive modelling. Professional analysts can build sophisticated streams with the advanced modelling capabilities. Whats's hidden in your data? Find out with data mining and text analytics. A spreadsheet is a wonderful invention and an excellent tool – for certain jobs. All too often, however, spreadsheets are called upon to perform tasks that are beyond their capabilities. Whether you are a basic business user, analyst or programmer IBM SPSS Statistics will help you move beyond spreadsheets to find the answers you need to run your business better, faster, more efficiently and more profitably. • Manage large data sets - millions of rows in fact. • Eliminate costly sorting jumbles and identify duplicate or missing records. • Automate reports, analysis or charts and update them with a single click. • Use words instead of numeric code - no more guessing what variables means. • Use advanced analysis techniques. In today's competitive marketplace, building long lasting relationships with customers is key to increasing customer lifetime value, satisfaction and advocacy. But as the modern multi-channel consumer becomes more empowered than ever, organizations are struggling to identify the right customers to target with the right offers through the right channels – let alone deliver this in the most cost-efficient way. By leveraging customer analytics, organizations move from reacting - chasing after a customer who has already defected, to predicting - proactively reaching out to customers to ensure satisfaction and recurring business. Quickly and easily develop reliable forecasts using time-series data whether you are a novice or experienced analyst. Predictive Analytics enables analysts to predict trends and develop forecasts quickly and easily—without being an expert statistician. People new to forecasting can create how processes. You get the information you need faster because the software helps you every step of the way. In this presentation, we explain the advanced statistical techniques and time saving features that will help you develop accurate and robust forecasts and predict future trends regardless of your level of expertise. Today's leading organisations recognise that the key to their business success relies on gaining deeper insight. In order to get a more complete picture, they must utilise data from a variety of different sources. IBM SPSS Data Collection delivers an accurate view of people's attitudes, preferences and opinions so that this valuable insight can be included in decision-making processes. Fix it before it’s broken! Can you spot problems before they happen to allow you to plan for asset failure, not simply react to it? Do you want to eliminate unnecessary scheduled maintenance and reduce overstocking of spare parts? Add Predictive Maintenance to your tool kit and consider the job done! If you're wondering how predictive maintenance could work for you this is your chance to find out. How can you keep more students enrolled until graduation...by knowing who's most likely to leave! You are undoubtedly aware of the costs that you incur when students leave before graduating, have you ever thought how you might change things if you knew exactly which students were most likely to leave? Hear how Dr Phil Ice from the American Public University System, can now predict with approximately 80 percent certainty whether a given student is going to drop out. Join us for this webinar where you can learn how you can improve student recruitment and retention using predictive analytics. Law enforcement faces greater challenges than ever before. In addition to promoting public safety and combating crime and violence, your agency has the added burden of managing limited resources. At the same time, the public expect you to deliver the highest level of safety and security. To meet these challenges, law enforcement agencies are trying a variety of approaches. Innovative information technologies are playing a key role in improving the ability to anticipate events and respond appropriately. Predictive analytics is one of the key technologies helping police departments worldwide to improve their crime fighting results. What if you knew in advance which tenants are most likely to default on payments or which equipment is likely to need repairing before it breaks? Think of all the money you could save not to mention the increase in customer satisfaction. At IBM SPSS, we are currently working with many UK Housing Associations to help provide better service, give insight to predict when assets need maintenance to replace the need for scheduled and preventative maintenance and importantly to allow you to detect which tenants are most likely to fall into arrears. Identify the tenants most at risk of falling into arrears before they do. Replace the need for scheduled maintenance, to give the Housing Association confidence to predict when assets need maintenance, to save money on property upkeep and storage of replacement parts and allowing you to redirect that money towards better customer experience. Get maintenance right first time by doing the basics well, ensuring call centres can reliably match notes with engineer logs. Health care institutions are awash with data and in this complimentary webinar we explain how predictive analytics can help you make sense of all that information to improve patient care and reduce costs. Findings can be used as evidence that, together with stakeholder involvement, professional expertise and clinical experience, will support operational decisions to improve service delivery both locally and nationally. There is short demonstration of predictive analytics being used to analyse clinical patient data in order to better manage outcomes in patients with chronic disease. Case studes covered include how predictive analytics is being used in hospitals in the UK and Ireland to reduce readmission rates and average length of stay, analysing complaints to identify key factors of patient dissatisfaction, improving bed management and key factors in bed availability and quality improvement and monitoring. Healthcare organisations around the world are forecasting future events and trends with IBM SPSS predictive analytics. They're then using this insight to improve patient care and operational efficiencies. Find out how you can do the same. Save time...Save Money...Save Resources...Improve Efficiency. Discover the power of analytics! IBM business analytics software uniquely enables your organization to apply analytics to decision-making, anytime, anywhere. IBM business analytics gives you the power to improve operations, manage risk and achieve better business outcomes through detailed insight into customer preferences and future actions.